Any questions? Contact us now using the form below. Left Bank Gallery is proud to present award-winning artist, Tamara Armstrong’s latest solo show, Women of Colour. On show from March 8th to 30th, this vibrant series of striking portraits sees Armstrong honour twelve fellow Australian creative women who have inspired her, and countless others, in their fierce pursuit of a life lived in brilliant colour and bold substance. 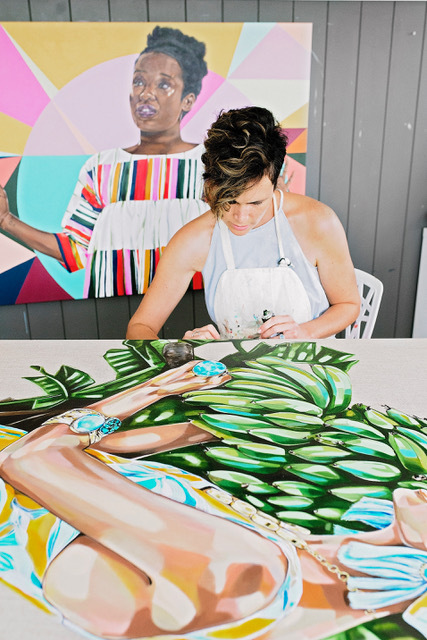 Created in her light filled Mount Tamborine studio, this high-spirited exhibition will launch on International Women’s Day with an exciting line up of ticketed events including an exclusive Creative Immersion Day on Thursday 8 March and a Gala Opening and Charity Auction on Friday 9th March. Patrons can also look forward to a range of artistic workshops that will take place throughout the month at Left Bank Gallery. Additionally Tamara will host two free artist talks on Thursday 15th and Friday 16th March for the general public, as well as hosting free school education talks. Like Tamara herself, her portraits demand respect. They are original, honest and unashamedly bold and vibrant. Feeling a connection or strong common ground with each of her twelve subjects, Tamara’s latest series celebrates fellow artists, writers, dancers, story-tellers and designers who are brave and passionate enough to pursue a creative life and career, empowering women around them who experience their contributions. Tamara hopes, “each portrait ignites a desire in the wider community to support more women in the arts and help drive the desire for art to flow freely from every woman.” She also invites the viewer to get to know each of her subjects on a deeper level by understanding what causes they hold close to their hearts. In doing so, Tamara will donate 20% of all artworks sold to the charities and not for profits nominated by each of her subjects.